She Just Finished Her 13th Ultra-Marathon at a Race Distance of 70 Miles! During the event,the 130 participants experienced high humidity,deep sections of mud, and pouring rain. 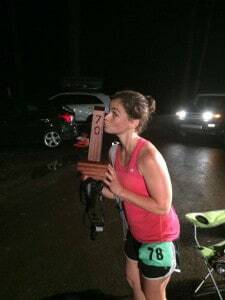 Despite the obstacles, Kristen Mam finished under her nineteen-hour goal as the tenth place woman finisher. Many people would think she’s crazy…. For most, the thought of running a marathon at just 26.2 miles is an extreme endeavor. Now imagine multiplying that distance by three. Join us as we take a look at ultra running and explain a bit more about the motivation and perseverance needed to happily run thirty, fifty or even one-hundred miles in a single race. An ultra marathon is any race that goes beyond the marathon distance of 26.2. There are a wide variety of ultra races throughout the world covering some of the most diverse and beautiful terrain our planet has to offer. Some of these races, like the Badwater 135 in California, are run primarily on the road. Road races can be difficult to plan because of the logistics of blocking traffic over such a long distance. As an alternative, most ultra marathons are run on trails where participants can enjoy beautiful scenery and a more-forgiving natural footing. This also comes with rocks, roots, and other obstacles just waiting to twist ankles and knees. During such a long race, it is understandable that ultra runners deal with some unique physical challenges. They are in constant risk of taking a misstep that could end it a rolled ankle, fall, or worse. This risk is elevated for those who enter into events without the proper conditioning. During the race, they also must deal with chafing, blisters, and the need to stay properly hydrated and fed during an effort that may take over 20 hours to complete. Some runners get too cold or experience a “fuzzy” sensation due to an electrolyte balance. Others experience blisters underneath their toenails that cause the nail to fall off. How Do You Train for an Ultra-Marathon? For Kristen, mental and physical preparation are tied very tightly together. If she knows that she has taken all of the correct steps to prepare her body during the months leading up to a race, she knows that her mind will provide the strength to make it through. She runs 4-5 days per week on the trails on the mountain near her Harrisburg, Pa home. As a stay-at-home-mom, she has some trouble finding free time to make it onto the trails and exclaimed, “Strollers don’t work on trails!” She makes it work and runs 6.2 miles on Tuesdays and Thursdays with another run on Wednesdays. Her weekly long run is on Saturdays and consists of anywhere from 10 to 40 miles depending on her training schedule. On Sundays, she fits in a middle distance run of 7 to 20 miles. On top of the running, she strength trains three days a week, attends a workout class once a week, does yoga, and takes lots of walks with her family. In the winter months when extreme cold, wind, and ice keep her off of the trails, Kristen likes running on the fancy TV connected treadmills at the gym. “I like a treadmill to have a lot of cushioning and to feel smooth. I really hate getting ones that feel old and clunky.” If you are looking for some of the best treadmill reviews so you can start training for your ultra-marathon, be sure to check out the rest of our site. 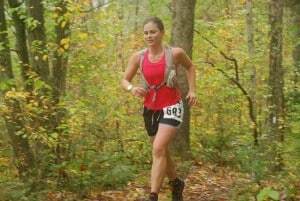 When asked about her proudest moments with ultra running, Kristen had two races in mind. In 2012, she managed to complete her first attempt at the 100-mile distance despite badly twisting her ankle on mile 10. She still finished in 29.5 hours. 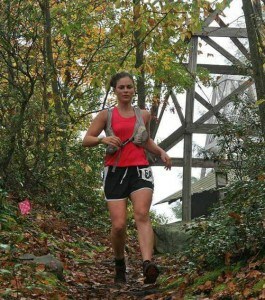 Her second great success came just this last weekend with the Laurel Highlands 70 miler. She had an extremely difficult last year, losing her mother to a rare form of breast cancer. She also battled injury after injury in the months leading up to this race leaving her feeling extremely unprepared. While many would have pulled out of the race, Kristen was determined to participate in at least the first 19 miles since she was running this as part of a relay team. After this leg was complete, she felt able to continue and eventually finished the entire 70 miles. It was just the most recent of many great successes for a woman who admits she used to hate running. So yes.. ultra marathoners are a little bit crazy. They are also courageous, determined, dedicated, fun loving, inspired, and incredibly talented people….and crazy again. Read more about training for long races here! Are you over the age of 40 years? Learn how to get rid of stubborn belly fat.